Montreal, May 25, 2015 – On April 29, 2015, the light shining into the night sky above Paranal, Chile was a little different. A tight yellow-orange 22-watt laser beam was emitted from the first of four new laser systems to be installed at the European Southern Observatory. Their purpose: to light up the sodium layer 90 kilometers up in the atmosphere in order to create an artificial star - Guide Stars. Guide Stars are used in astronomy to improve telescopic images. To combat atmospheric distortion, which causes blurred images, a deformable mirror is integrated in the telescope. A wavefront sensor is used to collect information as to how the atmosphere is affecting light from the star, and real-time corrections are computed to manipulate the hundreds of planes on the mirror to negate the distortion – adaptive optics. Real stars can be used, but they have to be bright and close to where the telescope is pointed. Creating artificial stars on demand opens up a whole new universe of photographic possibilities, while delivering images with much greater sharpness than previously possible. In this “next generation” Guide Star, narrow-band 1178-nm emission from a 25-mW diode laser is amplified to the 40-W level and then frequency doubled in a resonant cavity doubler to provide 22 W at the desired sodium resonance wavelength of 589 nm. The novel technology developed to achieve such high power amplification of an extremely narrow-band seed is the polarization-maintaining (PM) Raman fiber amplifier (RFA) developed by MPB Communications Inc. The unique design of MPB Communications’ RFA pump laser allows the compact laserhead (containing the RFA and doubler stage) and the larger electronics cabinet (containing the pump laser, seed laser, power supply and other electronic modules) to be mounted either directly on the Nasmyth platform of the telescope or up to 27 m apart, thereby providing unprecedented flexibility for installation on telescopes. 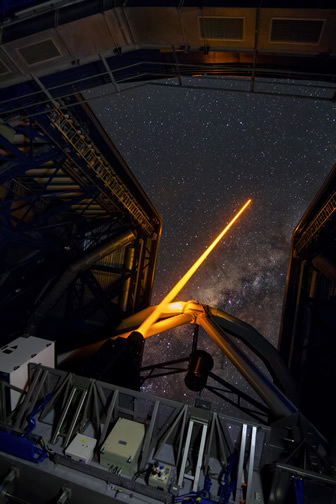 Credit: J. Girard/ESO The 4 Laser Guide Star Facility (4LGSF) team have achieved first light with the first of four laser guide star units on Unit Telescope 4 (UT4) of ESO’s Very Large Telescope at Paranal. This is a key step on the way to creating the full Adaptive Optics Facility. 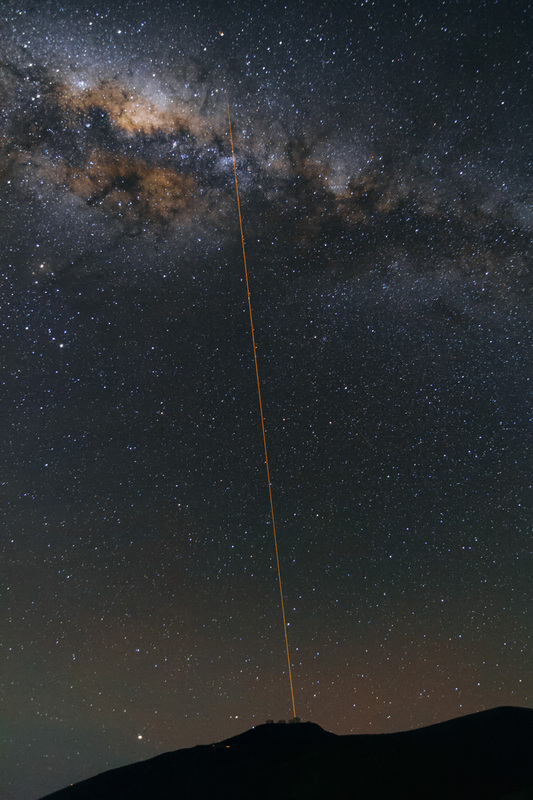 First light took place on the night of Wednesday 29 April 2015 and these pictures show the laser being launched into the night sky. The fiber technology avoids the use of any bulk optics, providing a compact and maintenance free architecture. “The utilization of MPBC’s Raman fiber amplifiers, together with their all-fiber pump lasers, for the new fiber-based guide star lasers represent a paradigm shift in performance, operational simplicity, compactness, maintenance and reliability,” commented Dr. Wallace Clements, Director of Engineering at MPB Communications Inc. The narrow-band Raman fiber amplifier technology for the laser guide star system was first developed and patented by the European Southern Observatory. MPB Communications Inc. and Toptica Photonics (Germany) licensed the technology and have collaborated for the past five years to develop a reliable, maintenance-free, ruggedized turn-key system suitable for installation in the demanding environments typical of astronomical telescopes. Toptica provided the narrow-band seed and resonant doubling cavity for the system while MPB Communications developed the Raman fiber amplifier (RFA) subsystem.